"My God, they're not going to give me run support, yet again. And why the hell is that Callaspo guy batting seventh again, Donnie? I can't take this crap." Once again burdened with the albatross of anemic Dodgers offense, Zack Greinke pitched into the eighth inning and won the rubber match for us against Miami, 2-0. His outstanding performance was again necessary, as the Dodgers' only real run came off a seventh-inning Adrian Gonzalez double (his 23rd, and 48th RBI), scoring Howie Kendrick from first. Kendrick got an RBI of his own in the fifth, but it was kind of a gift as a grounder to second with men at the corners scored Jimmy Rollins from third, but should have been an inning-ending double play if not for Adeiny Hechavarria's botched throw to first (Kendrick was safe as Justin Bour was dragged off the bag). Rollins went 1-for-4 and is at .211. Call the fireworks brigade. 2. 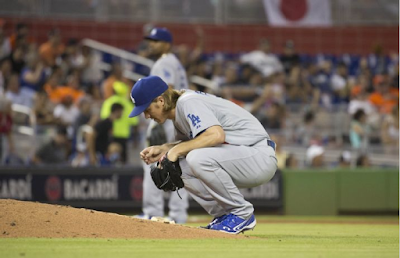 Zack Greinke, Los Angeles Dodgers: Greinke didn’t ask to be a show room display for the importance of run support, but finally, he got a win for the first time in 10 starts, beating the Marlins in Miami by a score of 2-0. Overall, Greinke is getting 3.75 runs per game in support on the season, but that’s counting a lot of scoring that happened in his first six starts, when he got his first five wins. Greinke has gotten just 2.6 runs per game over the past 10 turns (counting Sunday), and just seven runs total in his past five. Greinke’s scoreless streak is now at 20⅔ IP; can you blame a guy for doing whatever it took to get one measly win? So now Greinke is 6-2, but he should be at least 9-2, even with the sporadic support from the lineup. That’s because the Dodgers’ pen also hasn’t done him many favors, costing him three wins. That trio of victories taken away from Greinke’s season tally is not the most in the National League -- Kyle Hendricks of the Cubs and Julio Teheran of the Braves have both seen five wins slip away thanks to pen implosions -- but you’d be forgiven if you thought that if it wasn’t for bad luck, Greinke wouldn’t have any. 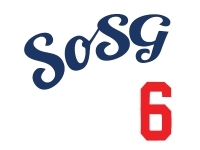 Even without those wins, Greinke should at least have the honor of following Max Scherzer in the All-Star Game. Off to Arizona for three, starting Monday. the Dodgers are paying these star pitchers over 20 million a year. quit whining about run support.they need to pitch shutouts every game for that salary.